The Minnesota Centennial Showboat is kind of a magical place to see theater. Stepping onto this historic docked boat on the Mississippi River across from downtown St. Paul, you're transported into another world. Last time I was there, it was the world of pre-WWII Berlin, not typically associated with a river showboat, but still a transformative experience. (And I'm just waiting for someone to do Show Boat on the Showboat; it's an opportunity too good to pass up, don't you think?) The Showboat is currently decked out as a Victorian Christmas, from the actors dressed in period costume who greet you, to the Christmas decorations, to the music in the show. It even smells like someone is baking Christmas cookies! 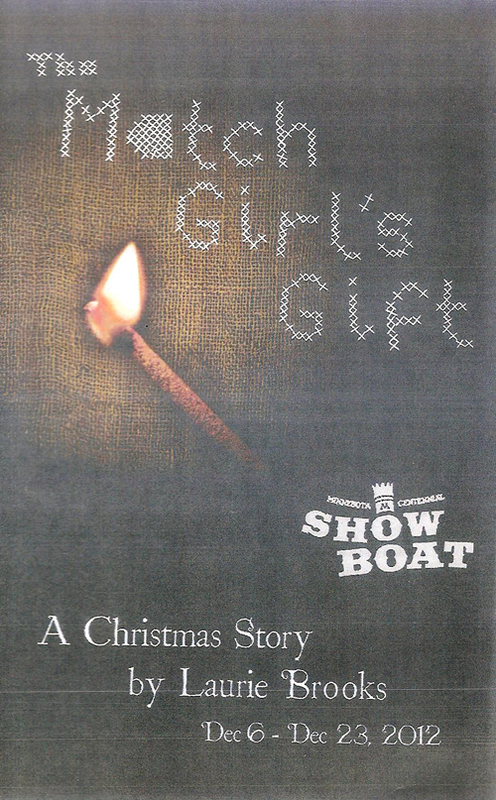 Two shows by Cerulean River Productions are currently playing in repertoire - The Match Girl's Gift and A Threepenny Christmas. I attended a Sunday matinee of the former, and I found it to be a cute and charming holiday show, sort of like A Christmas Carol lite. 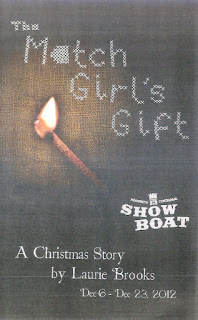 The Match Girl's Gift is based on the Hans Christian Anderson story "The Little Match Girl," in which a little girl freezes to death on the streets while selling matches, with only visions of her dead grandmother to comfort her. This version is a little less grim, with the match girl dreaming her way into the home of a wealthy family she has long envied. The plot is perhaps a bit simplistic and trite, focusing on the rich boy's dysfunctional relationship with his parents, desperate for their approval. But the performances of the cast make up for what is lacking in the story. In the title role, Jillian Jacobson, a 7th grader whose bio already includes the Guthrie Theater and Girl Friday Productions, is a star in the making. She's a completely natural actor who easily brings you along on her character's journey. Also charming is Clare Foy as her chimney sweep friend. Megan Volkman-Wilson again shines in a motherly period role (see also Sunday in the Park with George). But story aside, the highlight of this show is the music which begins and ends the show. The ensemble beautifully sings a selection of Victorian Christmas carols, accompanying themselves with a few instruments, and ringing out in gorgeous a capella harmony. I found myself somewhat impatient for the story to end so we could get back to the music! The Match Girl's Gift closes this weekend, but A Threepenny Christmas continues through December 30 (see schedule for details). There were quite a few families in the audience, who seemed to be having a great time. If you're looking for a charming Victorian Christmas experience, the Showboat's a good place to find it.